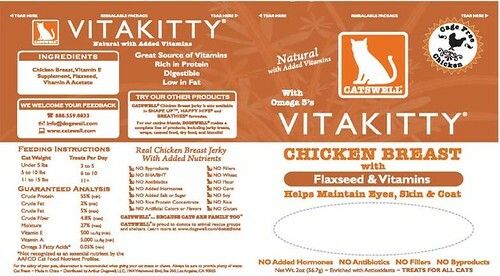 Recall : Vitakitty Chicken Breast ~ Pawsitively Humane, Inc.
FOR IMMEDIATE RELEASE - July 27, 2012 - Arthur Dogswell LLC, Los Angeles, CA 90025, is voluntarily recalling 1051 cartons packed as either 10 or 50 packages per case of Catswell Brand VitaKitty Chicken Breast with Flaxseed and Vitamins because it has the potential to contain propylene glycol. High levels of propylene glycol in the treats could result in serious injury to cats. The adverse health impacts could be reducing red blood cell survival time (anemia) and making the cells more susceptible to oxidative damage. The VitaKitty treats were distributed nationwide via retail stores and mail order from April 13th through June 14th, 2012. This product is packaged in a re-sealable 2 ounce orange plastic bag with a clear window. The VitaKitty Chicken Breast with Flaxseed and Vitamins lot codes affected are as follows: SEW12CH032701/03c and SEW12CH032702/03c with a best before date of 09/10/13 and 09/11/13, respectively (UPC code 8 84244 00057 2). Lot codes can be found on the bottom right backside of the package. The recall resulted from a routine surveillance sample collected by the Company and the Food and Drug Administration. Arthur Dogswell has ceased distribution of the affected product.